Samsung Electronics will be the first OEM to integrate directly with Telefónica Digital’s billing capabilities via the BlueVia payment APIs. Under the terms of the global framework agreement, Samsung Hub and Samsung Apps’ customers will be able to purchase apps and music, video, books, games and learning services from their devices by simply charging the payment to their phone bill or prepaid credit, avoiding the need for a credit card. The agreement covers both Samsung tablets and mobile devices. The companies believe that carrier billing for mobile apps will be especially useful in the developing world where the penetration of credit cards and even bank accounts is low. Direct to bill on Samsung devices will be rolled out to Telefónica’s operating businesses in phases, and it is anticipated to start with Telefónica Germany in the coming months. Sprint completed its previously announced acquisition of 20 MHz of PCS spectrum in the 1900 MHz band in various Midwest markets from U.S. Cellular. The deal includes 20 MHz of PCS spectrum in Chicago, South Bend, Ind. and Champaign, Ill. and 10 MHz of PCS spectrum in the St. Louis market. In addition, the transaction includes approximately 420,000 U.S. Cellular customers. The deal was valued at $480 million at the time it was first announced in November 2012. 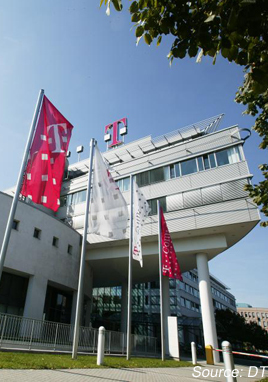 Vodafone Germany and Deutsche Telekom reached an agreement that will allow Vodafone to offer high-speed fixed-line broadband and IPTV services across Germany. Vodafone will initially use DT's VDSL network under a bespoke "Layer 3" (IP-based) bitstream agreement. This will allow Vodafone to offer its customers connection speeds of up to 50 Mbps (rising to 100 Mbps once DT has deployed vectoring technology) as well as Vodafone’s own on-demand and broadcast IPTV services. Vodafone will also gain access to a more advanced Layer 2 Ethernet-based bitstream product that DT will make available to Vodafone from 2016. This will allow an even greater level of differentiation and control over the design and delivery of the services that Vodafone offers to consumers and enterprise customers. Germany's Federal Network Agency must approve the deal. Vodafone Group Chief Executive for Northern and Central Europe, Philipp Humm, said: "Our agreement with Deutsche Telekom will greatly enhance our ability to offer our German customers a range of competitive, high-speed broadband and TV services, in addition to our industry-leading mobile services, in line with our broader Europe-wide strategy." Samsung Electronics Co. announced the industry’s first 45nm embedded flash (eFlash) logic process development. Potential applications include components for security solutions and mobile devices, including smart card IC, NFC IC, eSE (embedded secure element) and TPM (Trusted platform modules). Samsung said a smart card IC based on this 45nm eFlash logic process has an endurance of 1 million cycles per flash memory cell (double current endurance results) and that random access time to read memory is 50 percent faster. Power efficiency is enhanced by 25 percent over previous products built on the 80nm eFlash logic process. PernixData, a start-up based in San Jose, California, raised $20 million in Series B funding for its scale-out, software-defined storage platform. PernixData's Flash Virtualization Platform (FVP) is targeted at virtualized data centers. The company was established in February 2012 by Poojan Kumar, a co-founder of Oracle Exadata, and Satyam Vaghani, VMware's Storage CTO, creator of VMware's clustered file system (VMFS), and architect of several storage-related innovations at VMware over the last decade. Italtel's NetMatch-S Session Border Controller (SBC) has gained certification from Microsoft for interoperability with Lync 2013. NetMatch-S is the only SBC that currently interoperates with the Microsoft Communications Platform and can be installed in virtualized environment. Italtel joined the Microsoft Unified Communications Open Interoperability Program (UCOIP) and is the first vendor of Session Border Controllers, at European level, to have been certified under the Microsoft program. Lync 2013 is Microsoft's Unified Communications & Collaborations platform for IP networks of Small Medium Enterprises, Corporate Companies, Service Providers. Atlantis Computing, a start-up based in Mountain View, California, raised $20 million in Series D funding for its data center storage optimization solutions. Atlantis Computing, which was founded in 2006, developed technology for decoupling applications from storage just as the hypervisor decoupled the application from the server hardware. The company says its solutions eliminate the dependency on high performance and close proximity storage to enable any application to run on-demand with any storage. Atlantis ILIO enables both Virtual Desktop Infrastructure (VDI) and virtualized XenApp to run entirely in-memory without physical storage. Atlantis ILIO will be available soon for cloud-scale deployments of virtual servers such as databases, collaboration and mail servers. The new funding round led by new investor Adams Street Partners. Previous investors Cisco Systems, El Dorado Ventures and Partech . euNetworks has built a diverse fibre route from London to Basildon, a town 40km east of Central London that is the location of many data centres critical for the financial industry. euNetworks is now offering connectivity on its London network from 100 Mbps Ethernet to 10 Gbps wavelengths. In December 2012, euNetworks launched its leading ultra low latency fibre route linking Basildon to Frankfurt.